What’s bad for the environment is also bad for our brains. Alzheimer’s disease is a progressive brain disease that eventually strips sufferers of their ability to remember, communicate and live independently. By 2050, it is projected to affect nearly 14 million Americans and their families, with an economic cost of one trillion dollars – more than the estimated combined total for treating heart disease and cancer. Of the leading causes of death in America, Alzheimer’s disease is the only one that we currently cannot prevent, cure or even stall. Our latest research seeks to change this situation by providing a better understanding of the environmental causes and mechanisms behind the disease. Our findings lead us to conclude that outdoor air pollution, in the form of tiny particles released from power plants and automobiles that seep into our lungs and blood, could nearly double the dementia risk in older women. If our results are applicable to the general population, fine particulate pollution in the ambient air may be responsible for about one out of every five cases of dementia. This study, the first to combine human epidemiologic investigation with animal experiments, adds to a growing body of research from around the world that links air pollution to dementia. It also provides the first scientific evidence that a critical Alzheimer’s risk gene, APOE4, interacts with air particles to accelerate brain aging. Previous research at the University of Southern California has already established that air pollution accelerates the risk of having a heart attack. Based on this work, we established the AirPollBrain Group to examine whether and how exposure to fine particulate matter – known as PM2.5 because the particles measure 2.5 micrometers or less in diameter – impacts the aging brain. We designed this study to answer three broad questions. First, we wanted to know whether older people living in locations with higher levels of outdoor PM2.5 have an increased risk for cognitive impairment, especially dementia. We also wanted to know whether people who carry the high-risk gene for Alzheimer’s disease, APOE4, are more sensitive to the damage potentially caused by long-term exposure to PM2.5 in the air. Our third question was whether similar findings could be observed with controlled exposures to particles in mice modified to carry human Alzheimer’s disease genes. If we found similar effects in mice, it could shed light on possible mechanisms underlying what is happening in human brains. We focused on older women and female mice because APOE4 confers a greater Alzheimer’s disease risk in women than in men. For the human epidemiologic study component, we collaborated with investigators from the Women’s Health Initiative Memory Study, or WHIMS, which followed a large group of older women nationwide, starting in the late 1990s when these women were 65 to 79 years old but did not have dementia or any significant cognitive impairment. We combined EPA monitoring data and air quality simulations to build a mathematical model that allowed us to estimate the everyday outdoor PM2.5 level in various locations where these women lived from 1999 through 2010. Because the WHIMS followed its study participants very closely, we were able to gather detailed information on other factors that may affect an individual’s risk for dementia, such as smoking, exercise, body mass index, hormone therapy and other clinical risk factors like diabetes and heart disease. This allowed us to account for these other factors and better isolate the effects of air pollution exposure. We found that women exposed to higher levels of PM2.5 had faster rates of cognitive decline and a higher risk of developing dementia. Older women living in places where PM2.5 levels exceeded the U.S. Environmental Protection Agency’s standard had an 81 percent greater risk of global cognitive decline and were 92 percent more likely to develop dementia, including Alzheimer’s. This environmental risk raised by long-term PM2.5 exposure was two to three times higher among older women with two copies of the APOE4 gene, compared with women who had only the background genetic risk with no APOE4 gene. For the laboratory studies, we exposed female mice with Alzheimer genes to nano-sized air pollution for 15 weeks. The air particle collection technology, invented by our colleague Constantinos Sioutas from USC’s Viterbi School of Engineering, collects air particles from the edge of USC’s campus as a representative air sample from urban areas. The experimental data showed that mice systematically exposed to this particulate matter accumulated larger deposits of proteins called beta-amyloid in their brains. In humans, beta-amyloid is considered as a pathological driver of neurodegeneration and is a major target of therapeutic interventions to prevent the onset of Alzheimer’s or slow its progress. Similar to our epidemiologic observation in older women, these effects were stronger for APOE4 female mice, which are predisposed to Alzheimer’s disease. Our future studies will look at whether these findings also apply to men, and whether any drugs under development may provide protection against air pollution exposure. More work is also needed to confirm a causal relationship and to understand how air pollution enters and harms the brain. Brain aging from exposure to air pollution may start at development, so we also want to look at early life exposure to air pollution in relation to Alzheimer’s disease. We already know that obesity and diabetes are Alzheimer’s risk factors. We also know that children who live closer to freeways tend to be more obese, an effect that is compounded if adults in the household are smokers. Based on existing mouse models, one would predict that developmental exposure to air pollution could increase risk for Alzheimer’s disease. This is an important piece of the scientific puzzle that we’d like to better understand. Air pollution knows no borders. This gives our study global implications that should be taken seriously by policymakers and public health officials. The Clean Air Act requires the Environmental Protection Agency to develop National Ambient Air Quality Standards that provide an adequate margin of safety to protect sensitive populations, such as children and the elderly. 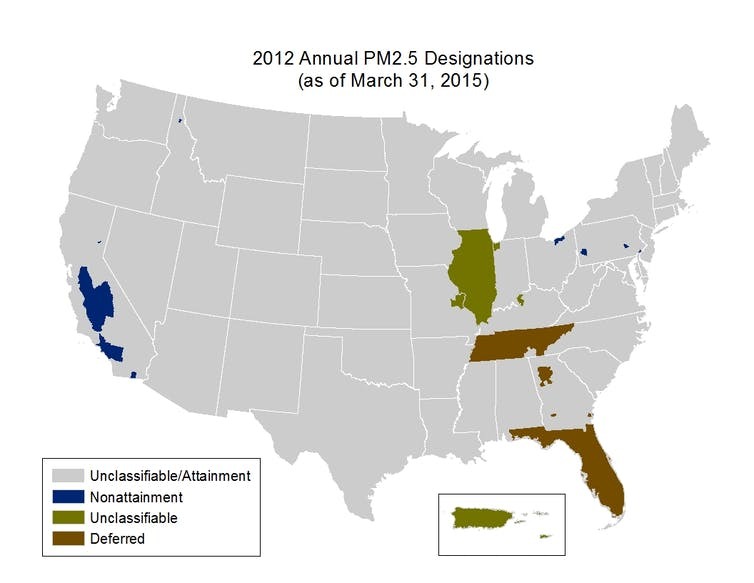 In 2012 the EPA tightened the U.S. standard for PM2.5. Nonetheless, in 2015 nearly 24 million people lived in counties that still had unhealthful year-round levels of particle pollution, and over 41 million lived in counties that experienced short-term pollution spikes. Recent studies have shown that the prevalence of dementia in the United States declined between 2000 and 2012. However, we don’t know whether this trend is connected to air pollution regulations, or if exposures to lower levels of PM2.5 in recent years still pose some degree of long-term threat to older Americans, especially those at risk for dementia. If long-term PM2.5 exposure indeed increases the risk for dementia, this would imply that public health organizations are underestimating the already large disease burden and health care costs associated with air pollution. For instance, the World Health Organization’s latest assessment of the global burden of disease caused by PM2.5 does not include dementia. Air pollution levels are much higher in India, China and many other developing nations than U.S. levels. Similarly, EPA has estimated that the Clean Air Act will provide almost US$2 trillion in benefits between 1990 and 2020, much of it from reduced deaths and illnesses. If there is a connection between particulate pollution and dementia, the Clean Air Act may be providing even larger benefits than EPA’s estimate. The U.S. National Plan to Address Alzheimer’s Disease, which was mandated by legislation enacted in 2011, aims to prevent or effectively treat Alzheimer’s disease by 2025. We believe any measures that undermine EPA’s operation or loosen clear air regulations will have unintended consequences that will make it challenging to meet this goal.